Summer flew by, as it always does, which means one thing: kids heading back to school. And that, of course, means back-to-school shopping. You want your kids to take pride in how they’re dressed while they want to express their own style and independence through their clothing. So we took some of the pressure off moms and dads and called in the professionals. TODAY correspondent, and mom of three, Sheinelle Jones joined style expert Brooke Jaffe at Kohl’s, where two brave moms and their kids went for a shopping experience that turned out to be both positive and enjoyable. Meet Rhonda and her dynamic duo. Saniyah is nine, and her personality is a 10. 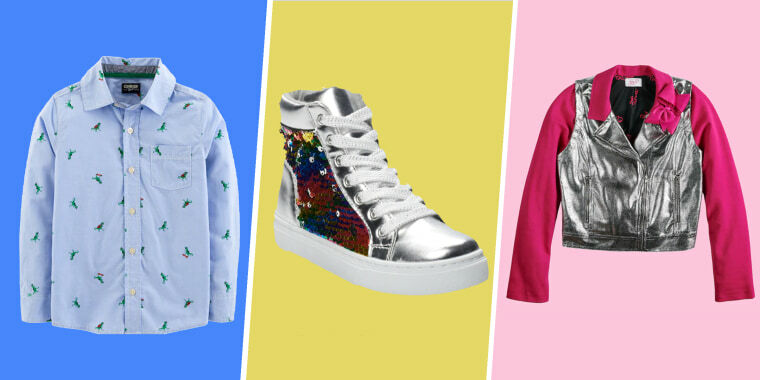 But when it comes to dressing up in anything but glitter, mom is coming up short. Natalia is a rising second grader. She’s smart and sassy but mom still isn’t convinced she’s ready to take charge of her own wardrobe. “They're still small and I don't want them to pick something that's not appropriate for them,” said Rhonda. Meanwhile, meet the Teague family. For 11-year-old math superstar Finn, comfort is king. As mom will tell you, he’s in shorts and a T-shirt 24 hours a day. Little brother Liam is eight years old, He can tell you the make and model of any airplane in the sky — but he needs help when it comes to elevating his style. “I want them to be comfortable because I know that's important to them. But something with a collar and look cute and pants and still be comfortable,” said their mom. We found looks that satisfied everyone. Confident kids + proud moms = a shopping trip for the books! And for more back to school kid-inspired fashion ideas, check out this video put together by our partner BuzzFeed with our sponsor Kohl’s.